Forget the unflattering, binding jeggings of the past; these stretchy, figure-enhancing skinnies fit like a glove. look like your favorite broken-in jeans, and have all the comfort of soft knit sweats. 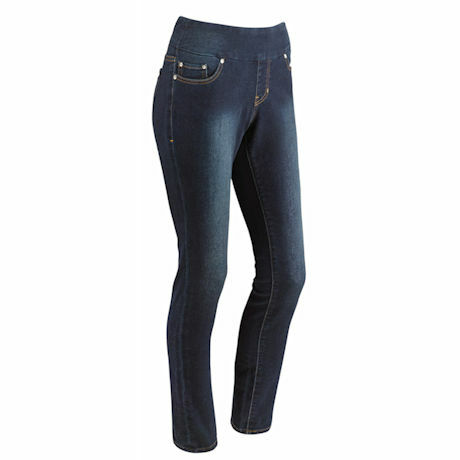 Comfort-cut wide waistband with 5-pocket-styling; zero zippers or buttons for ultimate softness. Indigo cotton/polyester/spandex blend. Machine wash. Imported. 30"L.